The conference focused on new chimeric antigen receptor (CAR) T-cell therapies for cancer and gene therapy for a rare genetic retinal disorder that often leads to blindness. CAR-T technology involves genetically altering a patient’s immune cells to target and destroy cancer cells. The launch of the first CAR-T therapy for B-cell acute lymphoblastic leukemia, Kymriah, came with a price tag of $475,000, not including the costs of hospitalization and supportive care. The launch of the gene therapy Luxturna came with a price tag of $850,000, or $425,000 per eye. These two breakthrough treatments and the pipeline of more to come raise concerns over access, affordability, and equity. Unlike other pharmaceuticals, CAR-T therapy involves extracting T cells from a patient, re-engineering them, and infusing them back into the patient. This unique aspect of the treatment brought up two comments: first, an audience member questioned why the process is considered a “drug” at all, rather than a procedure; second, a number of attendees pointed to technological and manufacturing process innovations as a way to bring down the price of these therapies. Several themes emerged from the opening panels. First, many intrinsic qualities of cell and gene therapies may require new thinking at the FDA to reduce unnecessary barriers to approval. Several participants noted that there is room for the expansion of “basket trials” that allow for simultaneous testing of the effect of one drug on a single mutation in a variety of tumor types, as well as combining phase 1 and 2 clinical trials and developing streamlined research protocols for cancer cell therapies. As part of his keynote address, FDA Commissioner Scott Gottlieb provided a detailed overview of current FDA efforts to develop technology- and disease-specific regulatory frameworks for these innovations, as well as pathways that accelerate the production of 2nd and 3rd in-class drugs to promote competition. Dr. Gottlieb discussed several adaptive trial designs under review at the FDA, as well as new ways to collect data after drugs enter the market. However, he stressed that the potential for new gene therapies to overwhelm the current health care system demands innovative payment policy for drugs that are approved. What kind of payment reforms are needed? Many treatments are essentially one-time infusions that provide benefits for years – possibly longer. Thus, the cost incurred over time in other settings might be condensed into a single fee for one-off curative treatment, creating budgetary challenges for both public and private payers. In response to high one-time costs, several panelists discussed the possibility of annualized payments. From the perspective of manufacturers and investors, the development of annuity payments to spread the cost over several years was attractive. But payers, including state Medicaid officials and private insurers, noted that the churn of beneficiaries through different insurers (private, Medicaid, and Medicare) presents a serious challenge to “mortgaging” payments for gene and cell therapies. 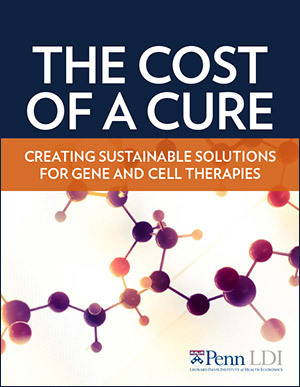 Cell and gene therapies are a transformational development for health care, but they may demand system-wide reforms on how we price and pay for them.